The Authorities designated route numbers 1 to 999 to cover the new railway TPOs for the Czechoslovakian lands (most used - not all), and two styles of handstamp were introduced from the middle of 1919 onward. The first style comprised the route names at the top and C(esko) S(lovenska) P(osta) with various ornaments at the base. 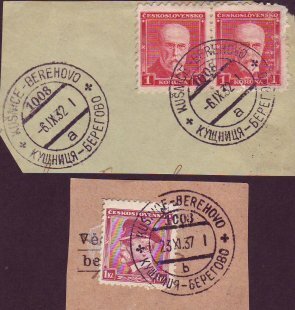 Some hand stamps of this style remained in use until 1939 although most were replaced soon after 1924. 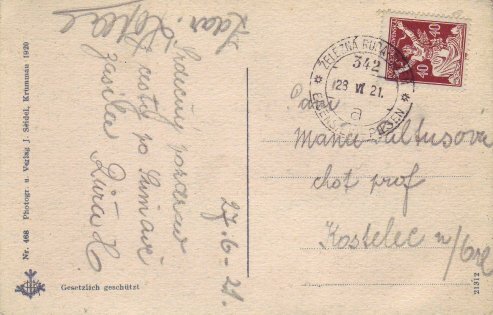 Issued at the same time as the CSP style of handstamp was a bi-lingual style, Czechoslovakian names in the top half with the German equivalent underneath. This style was generally used on routes starting or finishing in a German speaking area and was largely replaced in 1924. A third style of handstamp was introduced in 1921 for routes in the extreme east of the country where TPOs operated in what was Russia. These TPOs were numbered 1001, 1003, 1005, 1008 and 1011 and the handstamps were bi-lingual, Czechoslovakian over Cyrillic Russian. After the Occupation these route numbers were re-allocated. The route of TPO No 1008 (right) ran from Kusnica via Dovhe (Dovhoje), Irsava, Ardov to Berehovo (Beregsas). This whole route was later in the USSR. New style hand stamps were introduced to most routes from 1924 onwards and were of the type shown below. They are known with one or three ornaments. Note the addressee and the receipt. Nove Zamky - Topolcianky TPO (No 881) Side a, operated near the south east border. 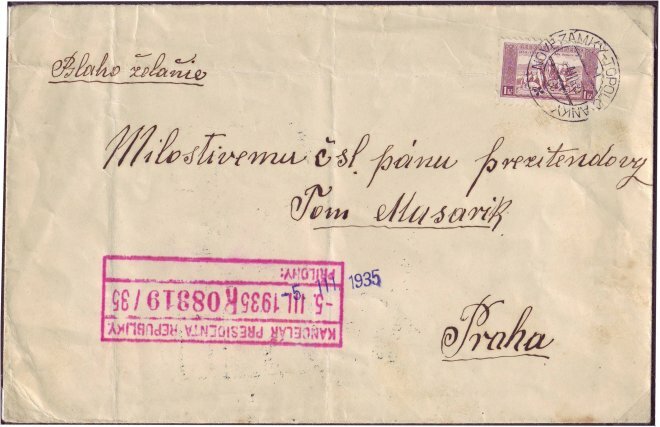 Note that the addressee - Tamas Masaryka - was the first President of the Czechoslovakian Republic. 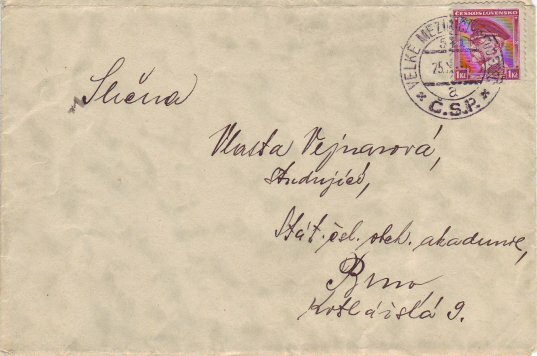 Some 2530 hand stamps were issued to the TPOs between 1919 and 1938 yet only one route, Nitra - Bratislava TPO (No 810) was of the double ring type. The handstamp was issued in 1926.